- George Walker Bush was born in New Haven, Conn., on July 6, 1946. - He grew up in Midland, Tex. - He attended the exclusive Phillips Academy--Andover (Mass. ), and received degrees from Yale (B.A., 1968) and Harvard (M.B.A., 1975) universities. - During the Vietnam War era Bush served (1968-1973) as a pilot in the Texas Air National Guard. He married Laura Welsh, a librarian, in 1977. - Bush spent much of the 1970s and 1980s working in the oil and gas business in Texas. - In 1987-1988 Bush worked on his father's presidential campaign as both an adviser and a speechwriter. After the elder Bush won the presidency, George W. Bush purchased the Texas Rangers team and ultimately became managing general partner of the team from 1989 to 1994. - Bush was first elected to public office relatively late in life. In 1994, at age 48, he won election as governor of Texas. - Bush benefited in the election from the public's desire for change after eight years of the Clinton-Gore administration. - Bush was narrowly declared the victor on the basis of the electoral vote, although he lost the popular vote. Because of the extreme closeness of the results in Florida, an unprecedented recount was automatically triggered there under state law. 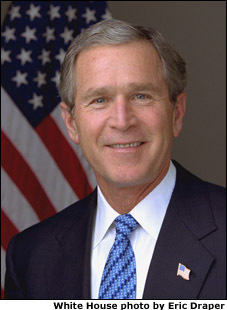 After more than two weeks, Bush was certified the winner. He was credited with 49.8% of the popular vote nationwide and 271 electors. The U.S. Supreme Court confirmed this result.